The U.S. National Transportation Safety Board issued three recommendations to reduce the impact of in-flight fires aboard cargo airplanes, saying current fire protection regulations are inadequate. The recommendations urge the Federal Aviation Administration to require active fire suppression systems in all cargo containers or compartments of cargo aircraft. They also recommend improving early detection of fires within cargo containers and pallets and urge that cargo containers provide better fire resistance. The NTSB has led or participated in the investigation of three fire-related accidents involving cargo aircraft in the past six years. 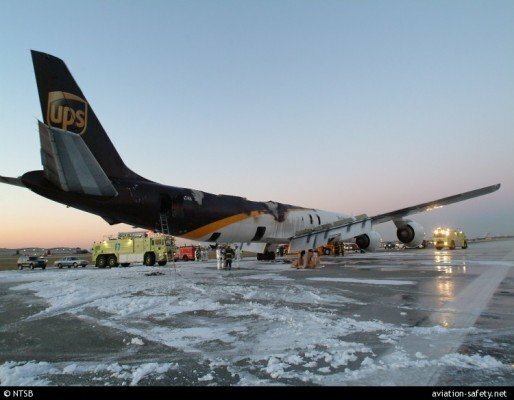 One involved a UPS aircraft in Philadelphia that was substantially damaged in 2006; another was a UPS flight that crashed in Dubai, United Arab Emirates, in 2010; and the third was an Asiana Cargo flight that crashed into the East China Sea off the coast of South Korea in 2011. The Dubai and South Korea investigations are ongoing under the direction of the repsective authorities. NTSB investigators found that the early stages of a fire burning inside a cargo container are concealed from detection. In later stages, when the fire grows and does become detectable, it rapidly intensifies and burns through the container to become a substantial threat to the aircraft and crew. In the UAE crash, the crew had just two and a half minutes between the fire detection and the onset of aircraft system failures. The air cargo industry is already actively researching and implementing new fire prevention and suppression technologies. FedEx for example is in the process of installing a fire-suppression system on its long-haul fleet.